The Samsung Galaxy 8/Galaxy S8+ and the iPhone 7 plus undergo the bend test challenge to prove how durable these beautiful looking phones are. Samsung and Apple have always been arch enemies in the phone business, each with a loyal customer base. 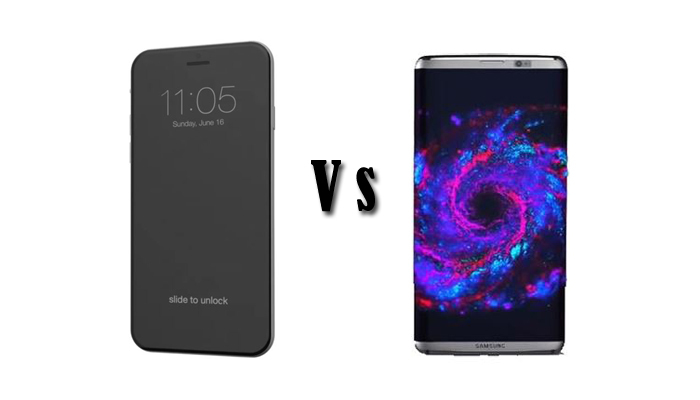 Their latest phones Samsung Galaxy 8 and the iPhone 7 plus respectively have been undergoing various tests to evaluate and rate their performance. The bend test challenge, which was conducted recently was to appraise and rate the durability of the phone. The ‘bend -test’ challenge of Samsung Galaxy S8+ against the iPhone 7 Plus was done by the YouTuber Filip on EverythingApplePro his channel on YouTube. The bend test begins with iPhone 7 undergoing the bend test and the results from this test show, how poorly Apple performed. The Apple product surrenders way sooner than expected. The phone bends very easily, with the display coming out of the phone. The results for Galaxy S8 + were positive when compared to iPhone 7 Plus. The glass and metal combo used in the front and the back side of the Galaxy S8 + phone made it difficult to bend the phone so easily. The phone was also placed on the edge of the table, though unlikely to happen under normal usage conditions.The force applied did not break the phone, but resulted in a slight bend. Thus, the bend test challenge clearly shows who is the winner and it’s Galaxy S8+. But before taking the results on the face value, we should keep in mind the impact of other external factors that may have influenced the performance. It should be noted that both these smartphones were already damaged because of the drop-test before. We don’t know the impact the previous damage had on the bend test challenge, but the results could have been different if these were brand-new or undamaged units.